Definition at line 3780 of file commctrl.h. Definition at line 3785 of file commctrl.h. Referenced by add_font(), COMBOEX_CopyItem(), COMBOEX_InsertItemW(), COMBOEX_SetItemW(), get_comboexlist_selection(), test_comboex_WM_LBUTTONDOWN(), and test_wm_notify(). Definition at line 3786 of file commctrl.h. 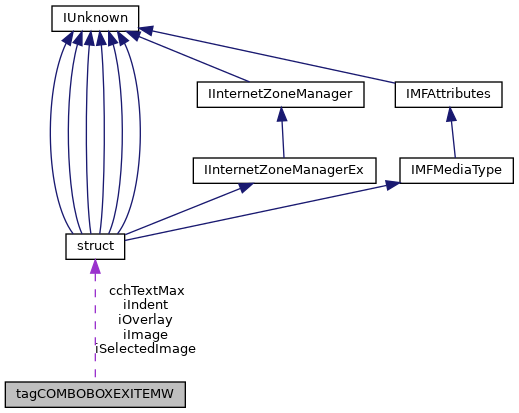 Referenced by COMBOEX_CopyItem(), COMBOEX_DrawItem(), COMBOEX_GetItemA(), COMBOEX_InsertItemW(), and COMBOEX_SetItemW(). Definition at line 3789 of file commctrl.h. Definition at line 3783 of file commctrl.h. Referenced by add_font(), add_size(), AddDlg_OnInitDialog(), COMBOEX_DrawItem(), COMBOEX_GetItemA(), COMBOEX_GetItemW(), COMBOEX_GetText(), COMBOEX_InsertItemW(), COMBOEX_SetItemW(), CredDialogFillUsernameCombo(), EditDlg_OnInitDialog(), get_comboexlist_selection(), populate_size_list(), and test_comboex_WM_LBUTTONDOWN(). Definition at line 3788 of file commctrl.h. Definition at line 3787 of file commctrl.h. Definition at line 3790 of file commctrl.h. Referenced by COMBOEX_CopyItem(), COMBOEX_DrawItem(), COMBOEX_GetItemA(), COMBOEX_GetText(), COMBOEX_InsertItemW(), and COMBOEX_SetItemW(). Definition at line 3782 of file commctrl.h. Referenced by add_font(), add_size(), AddDlg_OnInitDialog(), COMBOEX_CopyItem(), COMBOEX_DrawItem(), COMBOEX_GetItemA(), COMBOEX_GetText(), COMBOEX_InsertItemW(), COMBOEX_SetItemW(), COMBOEX_WM_DeleteItem(), CredDialogFillUsernameCombo(), EditDlg_OnInitDialog(), get_comboexlist_selection(), populate_size_list(), test_comboex_WM_LBUTTONDOWN(), and test_wm_notify(). Definition at line 3784 of file commctrl.h. Referenced by add_font(), add_size(), AddDlg_OnInitDialog(), COMBOEX_CopyItem(), COMBOEX_GetItemA(), COMBOEX_GetText(), COMBOEX_InsertItemA(), COMBOEX_InsertItemW(), COMBOEX_SetItemA(), COMBOEX_SetItemW(), CredDialogFillUsernameCombo(), EditDlg_OnInitDialog(), get_comboexlist_selection(), test_comboex_WM_LBUTTONDOWN(), test_notify_proc(), and test_wm_notify().